EMPOWERED LEGACY PLANNING GIVES BACK – Join us for a Hope Filled Holiday with Feed My Starving Children. At this time of year, we like to take some extra time to give thanks for all we have, which includes you! We are eternally grateful for our wonderful clients and referral partners. It is because of you Empowered Legacy Planning continues to grow. In this spirit, we would love for you to join the Empowered Legacy Planning family in celebrating the holiday season by volunteering with us at Feed My Starving Children’s Hope Filled Holiday event. Help turn hunger into hope with your own two hands by packing nutritious meals for hungry children across the globe. Feed My Starving children has a goal of 10,000 valley volunteers packing 2 Million Meals and feeding 6,200 children every day for a year at Arizona’s largest fundraising and MobilePack Event running from Friday, November 30-Sunday, December 2, 2018. Please join us on December 1, 2018, for a two-hour experience that will lift your spirits and save lives in the process. We can’t think of a better way to celebrate and make an impact this upcoming holiday season! Feed My Starving Children offers volunteers a one-of-a-kind experience. You’ll hand-pack rice, soy, dried vegetables and a nutritionally complete blend of vitamins and minerals into bags which are then sealed, boxed, placed on pallets and shipped to FMSC’s incredible partners working hard to reach the neediest children around the world. 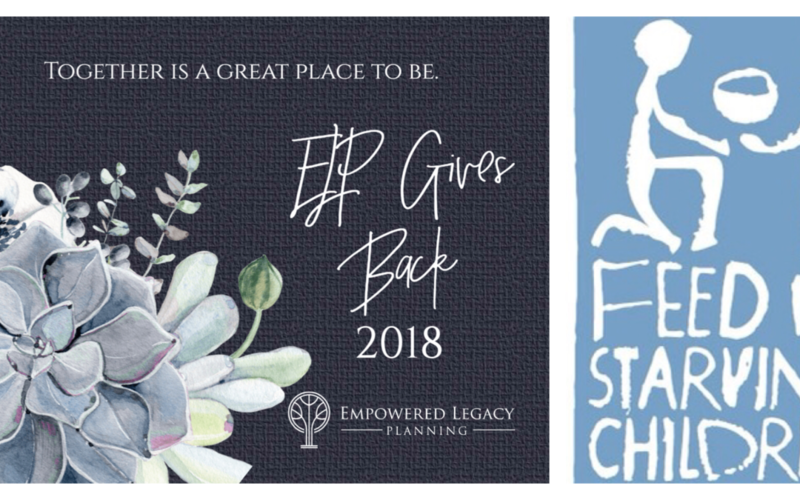 Empowered Legacy Planning will be making a donation to Feed My Starving Children on behalf of members of the ELP Family who join us for this packing event. You may also wish to make a personal donation to FMSC. As you’re willing and able, you may donate directly to Feed My Starving Children on the day of the event by cash, check or credit card, or online before or after you pack. RSVP BY NOVEMBER 17, 2018. For any questions, please contact Kathleen at: kathleen@legacylawaz.com. Packing Orientation: Please plan to arrive 10-15 minutes prior to your packing session to check-in. Your orientation and packing instructions will take place during prior to scheduled packing time. Attire: We highly recommend all volunteers wear closed-toed shoes. If you volunteer in the warehouse, closed-toed shoes will be required. Otherwise, please come in clean, comfortable clothes. Jewelry Policy: Due to FDA compliance for food manufacturing plants, NO jewelry may be worn in the packing room, labeling areas, warehouse area or when inspecting raw ingredients. Wedding bands are permitted. However if your band has a stone, you will be required to wear a glove.